This tail-end of the summer business really appeals to me. It’s this in-between summer and fall time when we seem to get the best of both worlds. Sweaters with shorts, jeans with t-shirts, less squinting while on the computer, fewer terrible runs, going to bed at 10pm without feeling nerdy (because it’s actually dark outside), I love it all. Equally great, the subtle shifts in food; soup is back, the tomatoes are still here, apples are crisp and juicy, warm breakfasts, and it’s no longer a sweat-based decision whether or not to turn your oven on. Cozying right into ‘pre-fall’, my oven is back in action and I’m making one of my favourite things. Just like this special time of year, this dish reminds me of my Mom, and embraces both really good tomatoes and the (slightly) cooler weather. 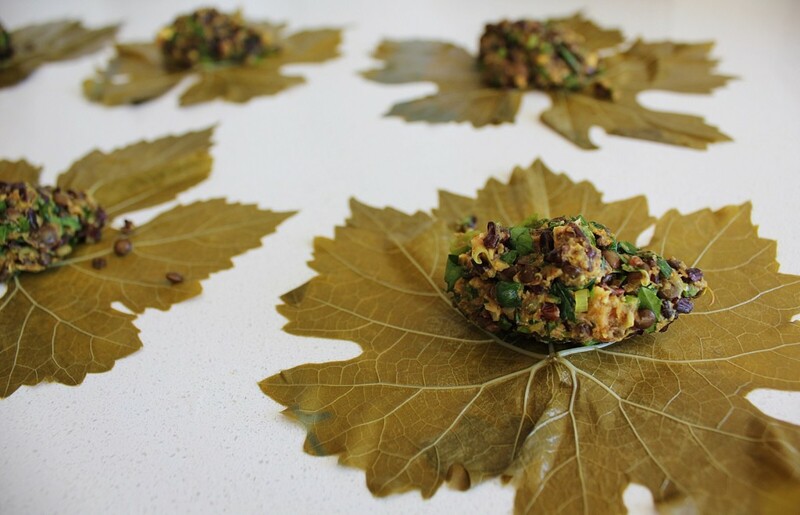 My sisters and I grew up on a version of these stuffed grapevine leaves that were filled with lamb or beef and rice and spices. 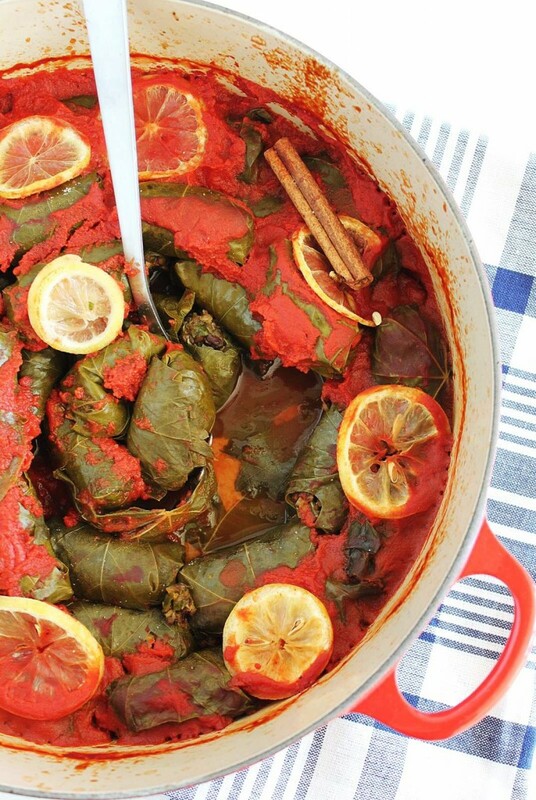 They were roughly Lebanese in origin, (although I’m not sure how classically) and baked in tomato sauce, as opposed to Greek dolmades, which are baked in lemon juice and chicken stock. 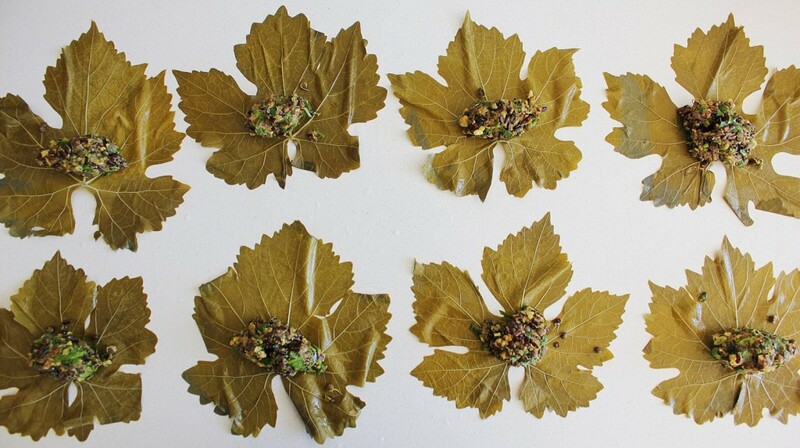 What I do know for sure is when we saw the grape vine leaves on the counter (either picked from my Granny’s garden or soaking in a bowl of water), we knew we were in for a good time (and possibly some child labour). If you have grapevine leaves growing in your yard, you are already ahead of the game (and please send me some!). If not, they are sold in a jar in brine, like capers, and are usually in the same area of the grocery store as olives, roast peppers and canned artichokes. If you are using the jarred version, make sure you soak and rinse them well to remove the majority of the salty brine. In the interest of combining soul food with cancer-fighting food, I have replaced the meat with sprouted lentils and walnuts, and subbed in black Japonica rice for the white rice (enzymes, fiber and pigment-power!). Doesn’t excite you? I’m aware that on paper this sounds like an unequal, salad-y trade, but trust me, just go with it. It’s not meat but once it’s all cooked together, it is pretty close to the same overall feel. Also in the mix – fresh garlic, red onion and green onion, all from the crushing cancer family -allium (family reunion). Turmeric is in there to lower inflammation, and cinnamon, which belongs in there flavour-wise, but also has a magical side effect of helping to lower blood sugar (bad news for cancer cells, good news for everyone else). 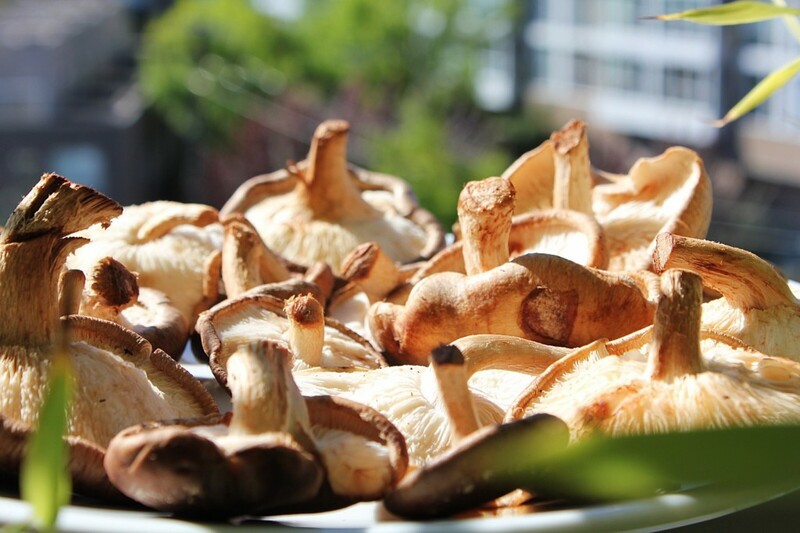 Fresh shitake mushrooms are in there too, adding their meaty, umame flavour, some immune-boosting powers and……. vitamin D(!) 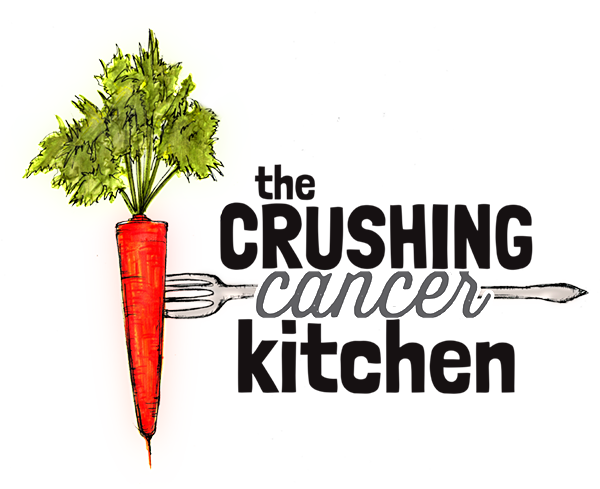 I learned last week, when I attended the Inspire Health (a not-for-profit integrative cancer center in BC) LIFE program, that fungi absorb vitamin D from the sun in a similar way that humans do. 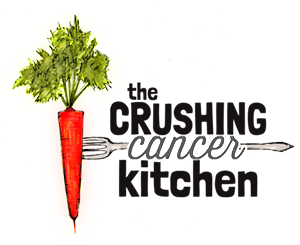 They are doing some fascinating research there on vitamin D levels and their effect on cancer. Sooo, I let them suntan naked for an hour on my balcony, gills-up, before using them to QUADRUPLE their vitamin D content. As the sun moves farther away from us, it’s good to know we have a pretty solid and attainable food source of vitamin D too. Apparently it works with any type of fungi. Totally exciting. I used passata (pureed and strained tomatoes, usually found in glass jars), a decent fresh tomato sub, but if the fresh tomatoes are still good where you are, use 4 cups of pureed tomatoes (literally, fresh tomatoes blended up in your blender) and leave them unstrained for extra fiber and vit C.
The lemon aspect of this dish is essential, so pay close attention: thinly sliced lemons go on BEFORE cooking (they mellow and you can eat them whole once cooked), and the fresh lemon juice goes on AFTER it finishes cooking. This way you get the benefits (and flavour accents) of the whole lemon as well as the benefits sharpness of the raw juice. 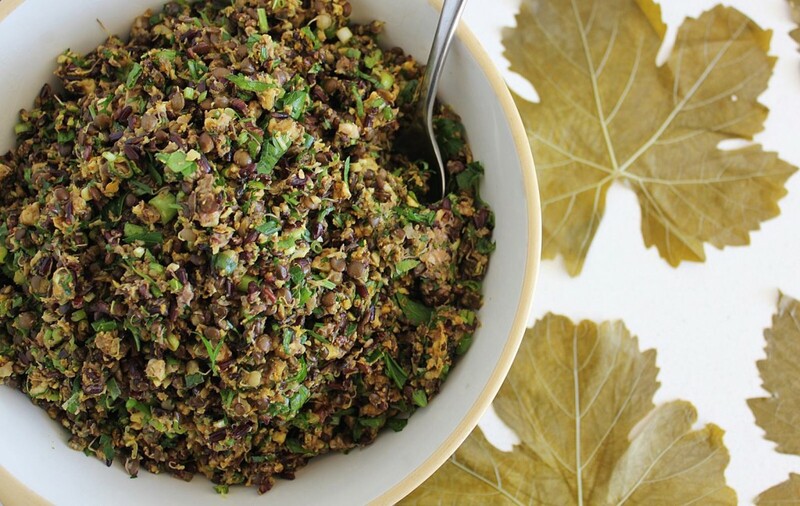 Serve this with tabouli, or a simple cucumber salad with lemon, mint and parsley. These are filled with protein, vitamins, and warm, cozy feelings. 1c Black Japonica Rice, soaked overnight, drained and rinsed and brought to a boil in ¾c water, turned off and let steam with lid on for 30 minutes. Cook the lentils in a pot of water with a sheet of kombu, until tender (10 minutes or so if sprouted, a little longer if just soaked), and then drain. Put the soaked, drained and rinsed rice in a pot with ¾c of water. Bring to a boil, put a lid on and turn off the heat. Leave for 30 minutes. Meanwhile, grind the soaked and rinsed walnuts in a food processor until about the size of the lentils. Reserve the walnuts in a bowl and set aside. Use the same food processor (dirty!) to grind up the red onion, garlic and shitakes (stem and all) together until they form a bit of a paste. Saute this paste in a large frying pan on low heat with the coconut oil. Add the spices and continue to cook, stirring occasionally until it dries out a bit and tastes less raw (taste it). Turn off the heat and add the cooked lentils (and kombu! ), rice and ground walnuts. 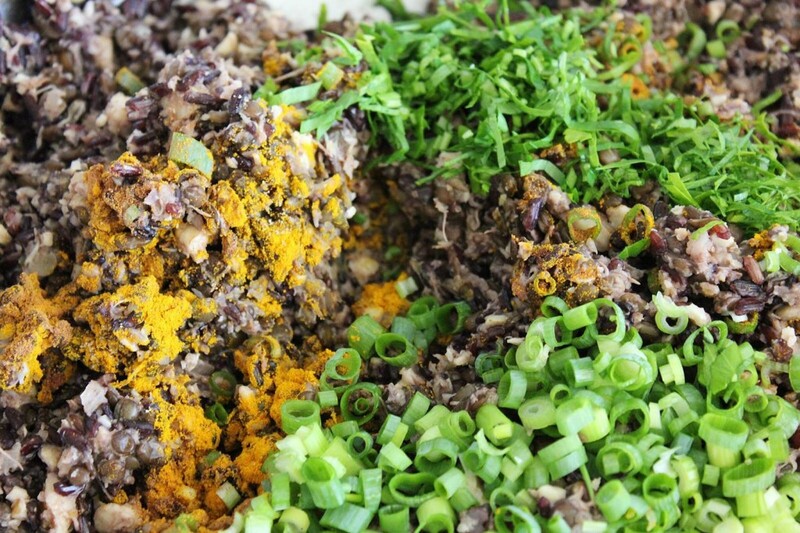 Chop up the green onions and parsley and zest the lemons, and add them in too. Stir it around and adjust seasoning (s&p) until it tastes really good. 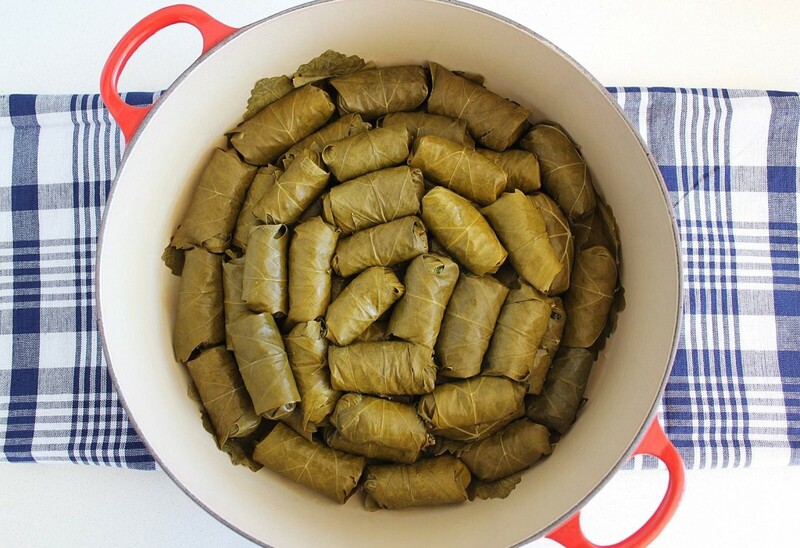 Fold the sides of the leaves in over-top of the filling and then roll the entire thing away from you, creating a tight little bundle. When you are out of leaves or filling, pour the tomato puree (or passata) evenly over the top. If you're using passata, fill it back up halfway with water, put the lid on and shake it around, and pour this over the top too. Spread the lemon slices over the top evenly. Bake in the middle rack for 30-40 minutes or until your house smells amazing. 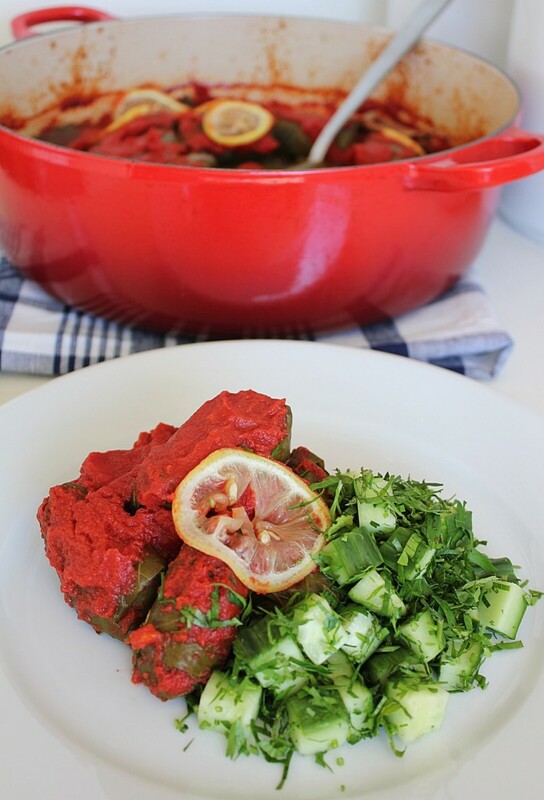 Pull out of the oven and sprinkle the lemon juice evenly over the top and let rest for 10 minutes before serving. If it dried out a little too much (everyone's oven/dish is different), add a few splashes of water and it will come back to life. If it's a little bit soupy, leave it in the oven for 10 extra minutes with the lid off. 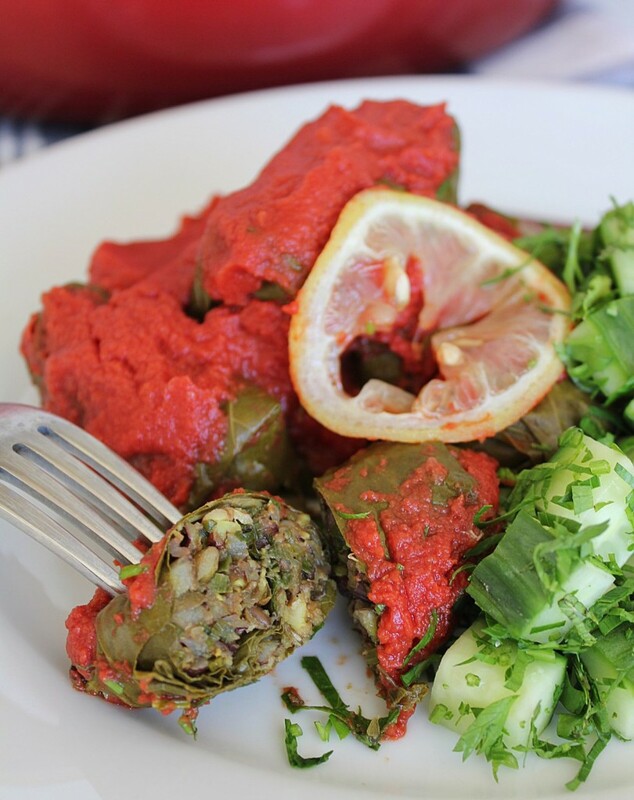 Enjoy with something fresh like tabouli, or a cucumber salad.